Details about the gang’s activities were revealed in a report by Kaspersky Lab at the weekend. 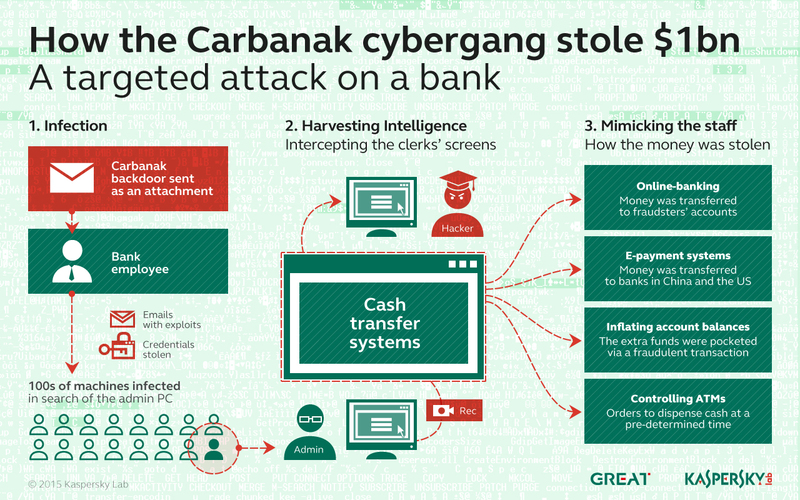 The thefts were initiated using spear-phishing, using an infected Word document to download the Carbanak malware onto a targeted individual’s computer. The hackers then used their access to the network to see and record everything happening on the screens of the staff who serviced the cash transfer systems, before stealing the funds. The whole process took on average two to four months from infection to completion. Funds were stolen from banks, e-payment systems and other financial institutions in Russia, USA, Germany, China, Ukraine, Canada, Hong Kong, Taiwan, Romania, France, Spain, Norway, India, the UK, Poland, Pakistan, Nepal, Morocco, Iceland, Ireland, Czech Republic, Switzerland, Brazil, Bulgaria, and Australia. According to Kaspersky, the attackers were highly sophisticated, leaving some cash behind to mask their tracks. In some of the attacks, the hackers accessed accounting systems, artificially inflating account balances and then removing the extra amount. For example, if an account had £1,000, they would change its value to £10,000 and then remove £9,000 for themselves. The account holder would not suspect anything, since the original £1,000 is still there. In other attacks, the funds were transferred to banks in China or the US. The attackers also hijacked the ATM network, ordering specific ATMs to dispense cash at a specific time. At the pre-determined moment, one of the gang’s members would be waiting at the machine to collect the payment. Security specialists have put forward a number of suggestions for how these kind of attacks might be mitigated in future. These include tighter control on communication channels, encrypting data at the data field level (thus rendering it useless to an attacker) and more monitoring and cross-industry coordination, as well as data sanitisation, in which incoming files are converted into another format, rendering the attacker script useless. Others were more pessimistic, and warned that solutions, while possible, would be difficult to implement since they required significant cooperation between banks, regulators and customers. They also worried that the Carbanak attack is a prelude to further harmful attacks in future. “The fundamental big concern this type of attack raises is that security monitoring cannot just test for vulnerabilities that are obvious and noticeable such as distributed denial of service, where a website is shut down by two or more hackers, and data theft,” said Mark Skilton, professor of practice and cyber security researcher at Warwick Business School. “ This is a cyber-threat of massive proportions, on an industrial scale, where eavesdropping and small changes need to be detected. I suspect this is just the tip of the iceberg of what may have been stolen and we may never know the full extent of the theft. The perception that hackers will inevitably be able to breach a company’s outer defences was widespread. However, some security experts believe this does not necessarily mean large losses are inevitable. Attackers are vulnerable at the point of entry, since their initial moves may be detected as hostile. Even if this is not the case, their access once in can also be restricted, preventing them from carrying out a complex attack. The full Kaspersky report can be read here. McAfee warns of imminent danger and an in-memory implant.